F*ck yeah. It's finally time to hear Negan's "The Walking Dead" Season 6 finale speech the way it was intended to play out. 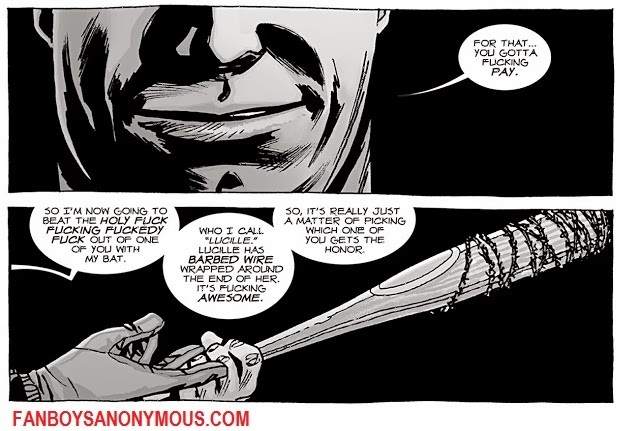 Robert Kirkman's comic book villain loves two things more than anything: his barbed-wire-covered baseball bat named Lucille, and the word "f*ck." But AMC is not HBO, so Jeffrey Dean Morgan's Negan had to make his debut saying things like, "I'm gonna beat the holy hell out of one of you" instead of "I am gonna beat the holy f*ck f*cking f*ckedy f*ck out of one of you with my bat," as he does in the comic. "The Walking Dead" Season 6 is coming out on DVD and Blu-ray this Tuesday, August 23, and The Hollywood Reporter got an early look at the Blu-ray's uncensored extended 11-minute Negan monologue. They counted the f-bombs and said the scene includes 23 variations of the word f*ck. Yep, our Negan is a salty mofo, if not a very original one with his language. "The Walking Dead" just started shooting the second half of Season 7. We're meant to get an answer on who Negan killed right in the Season 7 premiere, on October 23, but that's just the beginning. This is now Negan's world, and it's possible the Season 7 Blu-ray released next year will be jam-packed with alternate scene versions, with Negan -- and maybe others -- dropping more f-bombs on the zombie apocalypse.